2016 surpassed 2015 as the warmest year in 137 years of recordkeeping, thanks to the lingering influence of El Niño and long-term global warming. 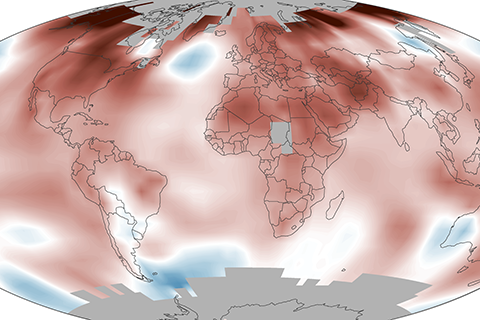 NOAA Climate.gov map adapted from Plate 2.1a in State of the Climate in 2016. 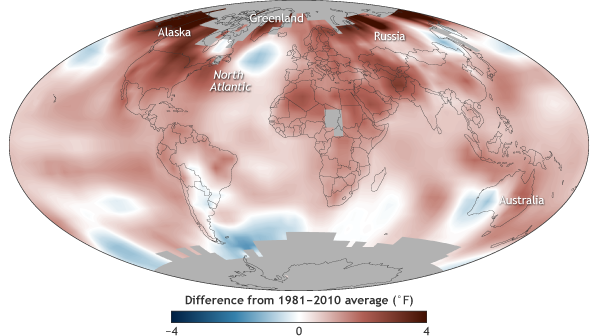 In 2016, the global surface temperature was 0.45°–0.56°C (0.8°–1.0°F) above the 1981–2010 average—a new record high, according to multiple independent datasets. NOAA Climate.gov graph adapted from Figure 2.1a in State of the Climate in 2016. The global average concentration of carbon dioxide hit a new record high in 2016. 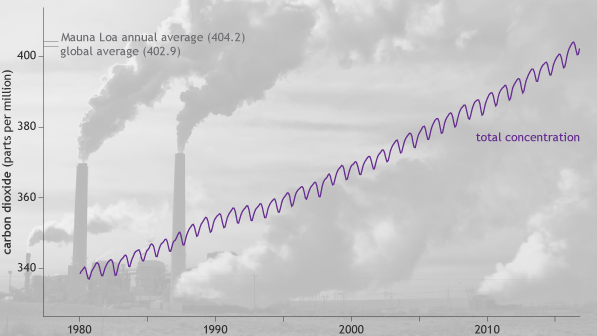 The increase from 2015 to 2016 was 3.5 ± 0.1 ppm—the largest one-year increase in the modern record. NOAA Climate.gov graphic, adapted from Figure 2.44a in State of the Climate in 2016. Photo by John Fowler via a Creative Commons license. 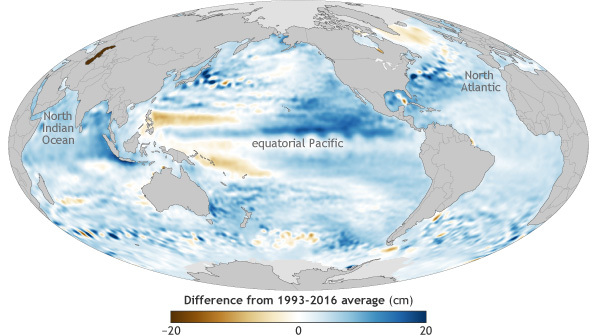 Most ocean areas experienced higher than average sea level in 2016 (blue) compared to the 1993-2016 average, with regional patterns due to a combination of long-term sea level rise, regional storminess, and natural climate variability. NOAA Climate.gov graphic, adapted from Figure 3.16a in State of the Climate in 2016. Sea level hit a record high in 2016. 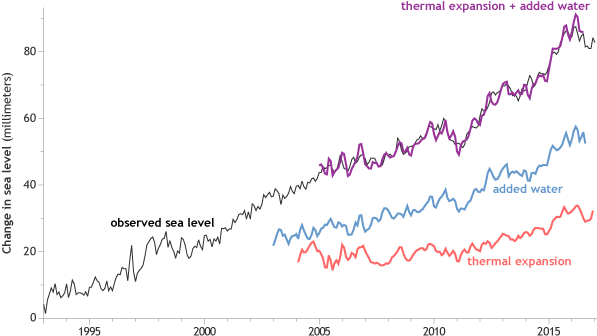 Independent estimates show that waters are rising due to meltwater from glaciers and ice sheets (blue line) plus thermal expansion (red line) of the ocean water as it warms (red line). NOAA Climate.gov graphic, adapted from Figure 3.15a in State of the Climate in 2016. 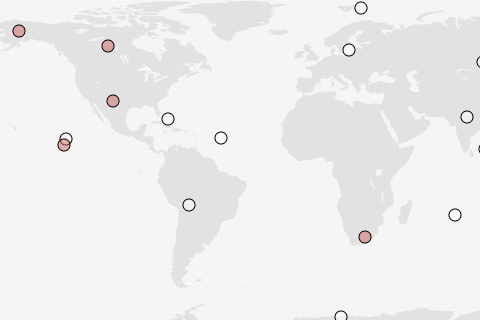 Mountain glaciers continued their global-scale retreat. 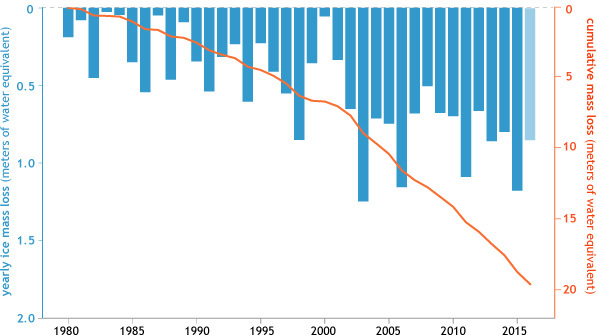 This graph shows glacier mass balance—the difference between ice lost through melting and ice gained through new snowfall—each year since 1980 (blue bars) for the 44 glaciers in the World Glacier Monitoring Service's reference network. NOAA Climate.gov graph adapted from Figure 2.13 in State of the Climate in 2016. Drought in 2016 was among the most extensive in the post-1950 record: more than half of the land area south of 20°N was subject to some degree of drought in 2016. NOAA Climate.gov map, adapted from Figure 2.1q in State of the Climate in 2016. 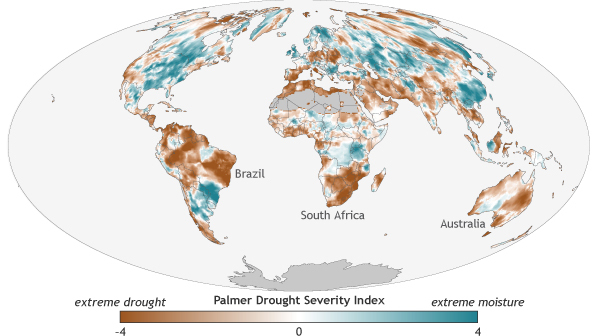 Every month of 2016 had at least 12% of the global land surface experiencing severe drought conditions and 4% experiencing extreme drought. A run of this length has not been matched by any other year in the post-1950 period. NOAA Climate.gov graph adapted from Figure 2.29 in State of the Climate in 2016. 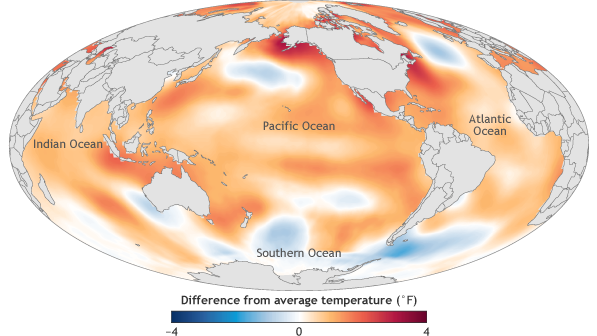 Despite the weakening 2015/16 El Niño event in 2016, the global average sea surface temperature in 2016 beat 2015 as the warmest year on record by a narrow margin. NOAA Climate.gov map, adapted from Figure 3.1a in State of the Climate in 2016. 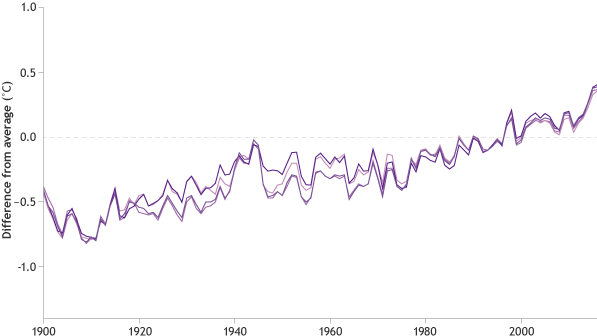 Record high temperatures at the ocean surface in 2015 and again in 2016 indicate a continued warming of the global oceans since at least 1950, with a faster increase between 2000-2016 than during the entire 1950-2016 period according to multiple independent datasets. NOAA Climate.gov graphic, adapted from Figure 2.1e in State of the Climate in 2016. 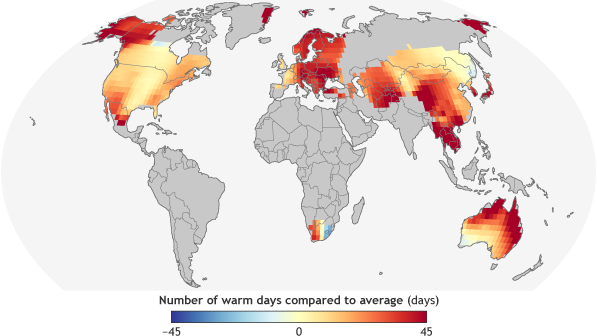 In 2016, large areas of the globe experienced more extremely warm days (temperatures above the 90th percentile for that location) than the 1961-1990 average. NOAA Climate.gov map adapted from Plate 2.1c in State of the Climate in 2016. 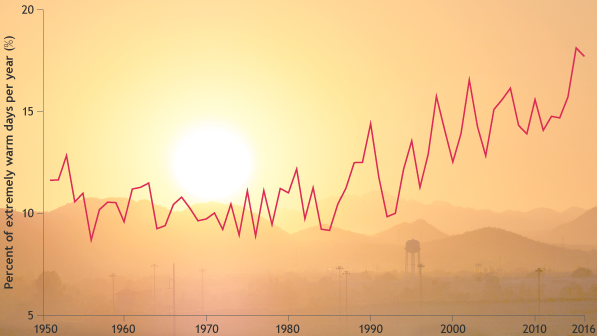 As the global average temperature has risen, so has the number of extremely hot days that occur each year. This graph tracks the changing frequency of days on which the temperature was in the 90th percentile of the historical record since 1950. 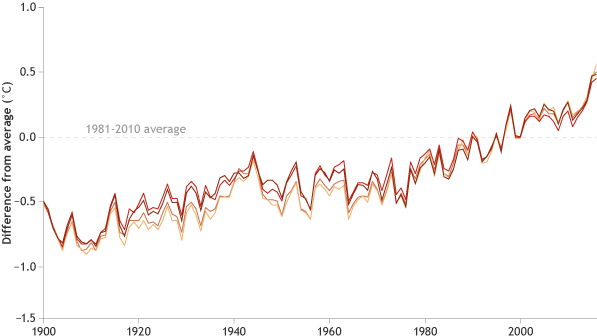 Graph by NOAA Climate.gov, adapted from Plate 1.1g in State of the Climate in 2016. 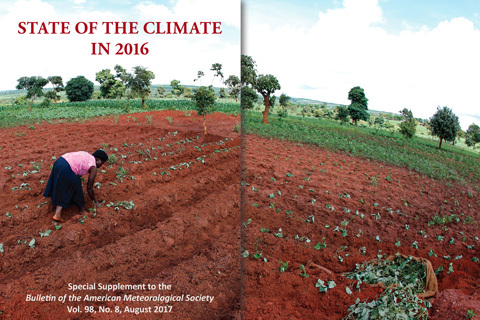 Led by editors from NOAA's National Centers for Environmental Information and published in the Bulletin of the American Meteorological Society, the "State of the Climate" reports are the planet's most comprehensive annual physical. 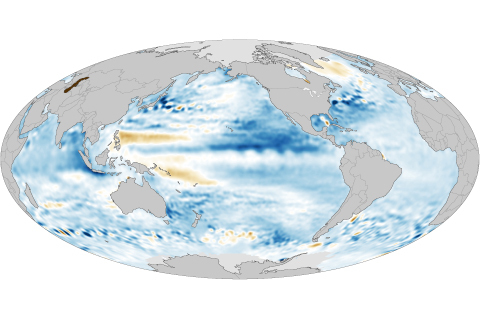 Each year from January to June, hundreds of scientists from around the world crunch the numbers on the previous year's climate, reviewing and cataloging everything from the humidity of the atmosphere, to the number and strength of hurricanes in every part of the ocean, to the size of the Arctic sea ice pack. Released on August 10, 2017, the report for 2016 documents an unprecedented milestone: global average carbon dioxide concentrations exceeded 400 parts per million for the first time in at least 800,000 years. 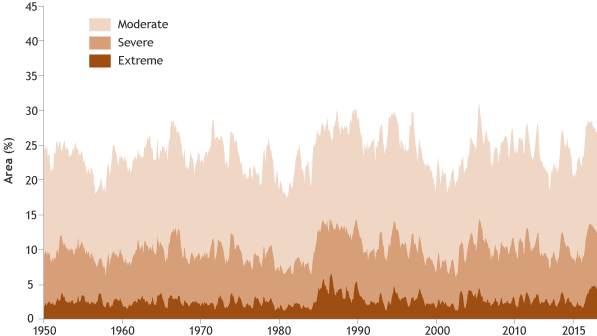 A strong, but fading El Niño contributed to temperature and rainfall extremes, including record-setting drought. From late-season Hurricane Mathew in the Caribbean and Atlantic to deadly heat in India, this map highlights the events that climate scientists put down in the record books as 2016's most significant. 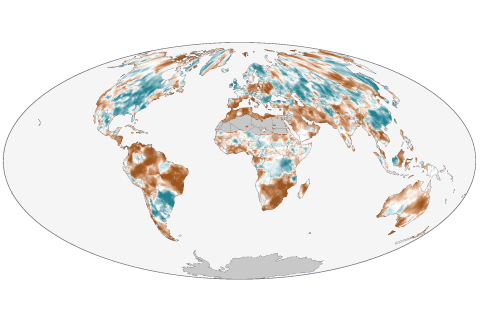 The map is an interactive version of the maps compiled each year for the annual State of the Climate Report, edited by NOAA National Centers for Environmental Information scientists and published in the Bulletin of the American Meteorological Society.